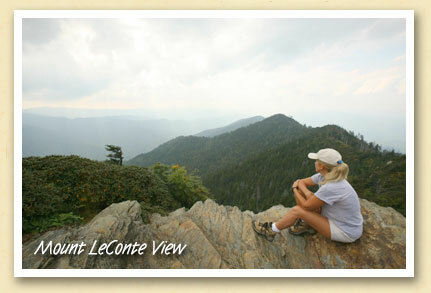 Postcards From The Smokies » The View From Mount LeConte. Well Worth The Hike. The View From Mount LeConte. Well Worth The Hike. The two most popular vistas in the Great Smoky Mountains are at Newfound Gap and Clingmans Dome, primarily because both are accessible by car …although there’s a fairly steep half-mile walk from the parking lot to the Clingmans Dome observation tower. The spectacular view from atop Mt. LeConte requires considerably more effort. It can only be reached on foot, the most popular route being the rather strenuous 5.5 mile trek along the Alum Cave Trail. From the parking lot on US 441, hikers climb 2763 feet to reach the 6593 foot peak, averaging more than 500 feet elevation gain per mile. But the reward is the breathtaking view that Shari Jardina enjoys above. Most make it a day hike — an 11-mile hike roundtrip. While there are overnight accommodations at the rustic LeConte Lodge, space is limited and in high demand. Reservations generally fill up months in advance. Shari is an Indianapolis photographer who’s captured many images of the North Carolina Smokies. This one was made by her husband Eric.